Please could someone post very simple instructions on how o integrate nUnit and dotCover? I have an existing class library project containing many nUnit tests, but I can't see how to integrate this with dotCover to see my code coverage? If you are using Resharper and dotCover, it's crazy easy. Resharper provides a unit test runner which integrates with dotCover. Choose the green dot in the left hand margin of the code window that contains your test. Click "Cover with dotCover". But if you're not using Resharper, then I think what you do is from VS, choose dotCover->Cover Application->Standalone Application->OK. In the application field put the full path to nunit.exe. (Which is the nUnit gui). Choose OK, and nunit will launch. From here proceed normally (add your assemblies, run the tests, etc). The dotCover Controller window launches. nUnit launches - if GUI then click "Run", if console then tests run automatically. 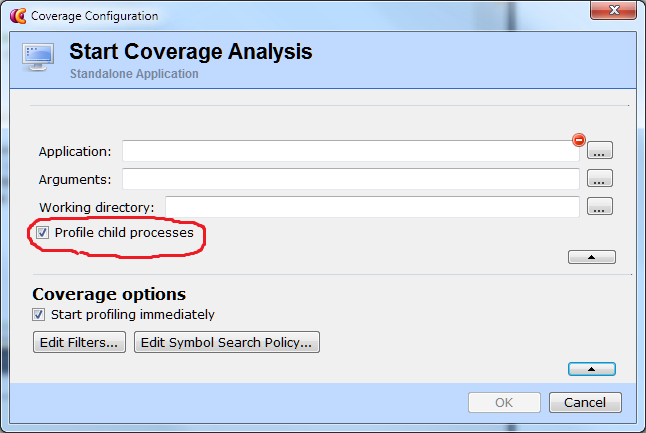 Either way, the results window shows no code coverage at all. It is correctly showing the assemblies that my unit tests are hitting, but zero coverage? Thank you for the detailed and correct answer. Does the class library you are testing have PDBs? I'm profiling the Debug build and all pdb's are in the debug folder. The coverage results match my solution - its just that all coverage is marked 0%. 1) You can disable project structure matching in order to see list of all assemblies included into report.